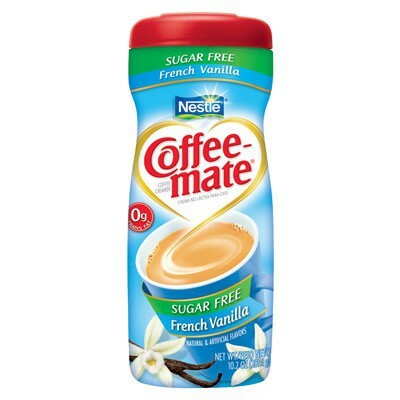 Coffee-mate French Vanilla, Sugar-Free Powdered Coffee Creamer is deliciously creamy, with classic vanilla taste that's perfect with a hot cup of coffee. 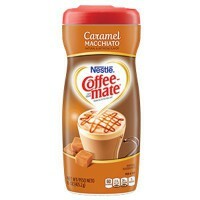 Dairy-Free, Lactose-Free, Cholestrol-Free, and Sugar-Free, each Coffee-mate French Vanilla Powder container yields approximately 58 1-tbsp servings. 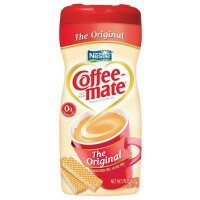 Enjoy some in your next cup of java, it's "coffee's perfect mate". 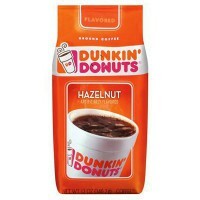 Hydrogenated vegetable oils (coconut or palm kernel and/or soybean), corn syrup solids, sodium caseinate (a milk derivative, not a source of lactose), natural and artificial flavors, less than 2% of: anti-caking agents E340-E554, emulsifier E471, salt, sweeteners E955-E950, yeast. Contains GMO. Nutrition facts (for 100g): calories 600Kcal, total fat 50g (saturated fat 50g), total carbohydrate 40g (sugar 0g), protein 0g, salt 1g. Dolcificanti non avendo zucchero per il sapore di vaniglia dando quel tocco in più. 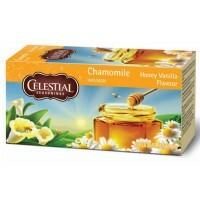 Je me régale avec ce produit dans le café.